Props & Proofs: It’s Prop Season for COLLECTED STORIES! Props for Collected Stories (and Collected Stories, itself). Collected Stories starts tech week this Monday, so it’s crunch time at the Harris household. As I hesitate, Hamlet-like, between different recipes for mondel bread (also known, I have discovered, as mandelbrot) I’m collecting various other objects and making the few things that I have to make. Because Collected Stories is getting a very realistic production and is what I consider reasonably contemporary, most of what the script calls for can be found. A lot of it’s paper: junk mail, the New York Times, books. In the photo to the right you see some of the books by other writers that are on Ruth’s shelf, which Lisa refers to during her initial visit. Curiously, Ruth doesn’t seem to have any of her own books on display in her living room–or if she does, Lisa doesn’t notice them. It doesn’t matter, because Lisa seems to have memorized all of them. 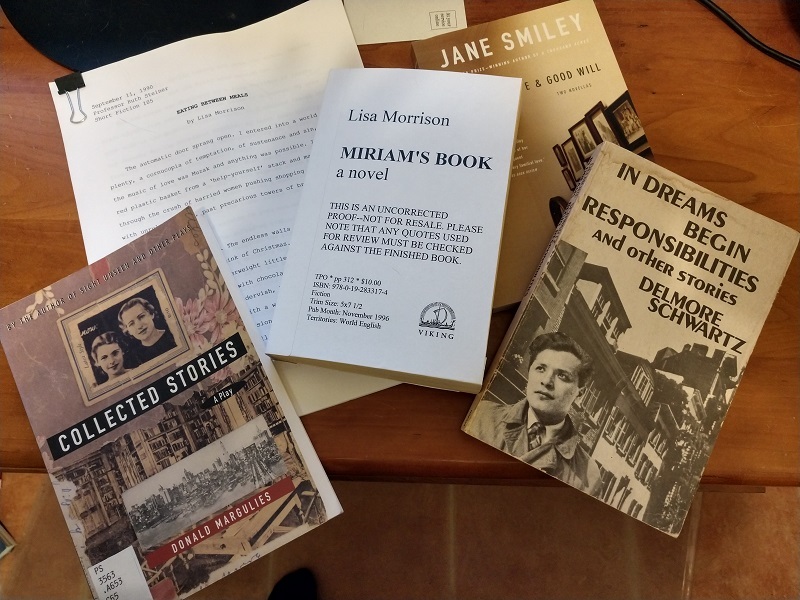 Collected Stories is about an established writer–Ruth Steiner–who takes on an aspiring writer named Lisa Morrison as her protegee, personal assistant, and various other things too difficult to define. It’s set almost entirely in Ruth’s living room (one scene takes place in the fabled 92nd Street Y, one of the focal points of a New York literary scene in which Ruth is already steeped and into which Lisa is longing to enter)–and, in a new departure for us, we are actually producing it in a living room. This is unspeakably exciting to me for many reasons; but as my role in this production is strictly limited to props this time around, let me confine my remarks to that aspect of the show. I am, right now, a little younger than Ruth (who is, per Margulies’s opening set description, supposed to “look every bit her fifty-five years”); in the 1990s, which is when the play is set, I was a few years younger than Lisa Morrison. A lot of things about both of these characters therefore feel familiar to me; but I find Lisa’s opening scene particularly poignant. Her earnestness, her ambition, and her eagerness to hear someone tell her that she’s not “wasting her time” by pursuing creative writing are vividly drawn and highly affecting. Over the course of the play, as Lisa’s career advances, the artifacts that document it become more sophisticated. The thing with the binder clip is the typescript of Lisa’s short story, “Eating Between Meals”–the first piece of hers that catches Ruth’s attention and inspires her to concede, albeit cautiously, that Lisa has something unusual–that, as she puts it, “the stuff is there, I think.” Like a lot of people’s early fiction, it’s autobiographical, and in their first conversation it’s clear that Lisa is still working on defining her style. This is just a bunch of sheets of paper that she’s printed out herself, probably on an overworked campus inkjet printer that jams. In the 92nd Street Y scene she will read from the proofs of her first novel, and in the final scene, we see the advance reader copy that Lisa has sent to Ruth, probably hoping for a blurb quote to go on the dust jacket. That’s the purpose of advance reader copies–they’re sent out to reviewers and to other writers so they can review them in advance of publication, and then generate publicity before the final version hits the stands. Lisa’s book comes out in 1996, just about the time people were beginning to discover something called the World Wide Web. There were no blogs, there was no Facebook or Twitter or Instagram or YouTube. Lisa is part of the last generation of writers who would do their work in a world of paper, and read their reviews on newsprint and in the columns of glossy weeklies like Time. Assembling the requisite periodicals is slightly tricky; publication dates are generally too small to see from any distance, but it’s hard to find something these days that doesn’t have Trump on the cover. Apart from that, the most challenging part of the job so far was making the advance copy. Most of the real work in Collected Stories is being done by the cast; and I haven’t seen any of that yet. I hear it is spectacular. Buy your tickets to Collected Stories early, because the space is small and seating is limited. You will be staring at my props from very close up. Let me know whether they succeed in maintaining the illusion! Congratulations to the Cast of CLYBOURNE PARK!